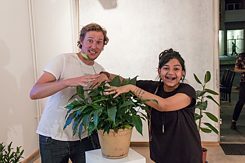 Bidisha Das is a creative artist and explorer with an inquisitive interest in Art and Science. © Bidisha Das Her medium of communication varies from sound to film, forest to the sky above, human beings and the animal world and nature to technological intervention. The creative journey through any fundamental inquiry plays an important role in her work which becomes an integral process leading to the design and the final expression and outcome. Both the wonder of nature and technology fascinates her immensely, and they often get reflected as an amalgamation in her work. Time has always interested her and with that the realisation that we all spend a tiny moment since our lifetime, compared to the vast universal time, is just like a speck of dust. And that makes every moment we live important, living in the moment beyond yesterday and tomorrow, the moment of ‘NOW’, the artwork that she is creating with the synth. 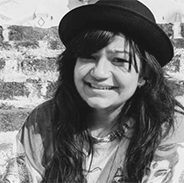 Bidisha graduated from Srishti School of Art Design and Technology, Bangalore, and has been a practicing artist ever since. In keeping with her interest in ethnographic film, ‘Voices from Khandadhar Hills' was her graduating project, a participatory documentary film with the Paudi Bhuyan tribal community in the remote forests of Odisha. She was a fellow in the Law, Environment and Design Laboratory at Srishti. 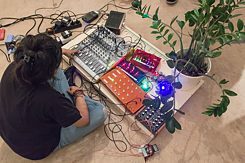 Her work has also explored building tools for research in sound-art practices at the Indian Sonic Research Organisation, Bangalore and she has performed at the HKW in Berlin. She also has been a part of several residencies including the first Arts Science Residency at Khoj International Artists Association, New Delhi. Later, her interest and inquisitiveness about nature and wildlife led her to work as a Rainforest Journalist deep in the Peruvian Amazon rainforest. Bidisha spent six months there and worked on conservation research and science communication. She is also a Darwin Scholar, as a part of the science programme in the UK. Besides the rainforest exploration, she has worked for future space mission design. She has been a part of a team to plan and design a human mission to an asteroid at the Jet Propulsion Laboratory at the California Institute of Technology, Pasadena. Currently taking all her experiences forward, she is exploring soundscapes and space art. NOW – A Kinetic Life, the outcome of Bidisha Das bangaloREsidency-expanded@Lacuna Lab in Berlin, © Bidisha Das is an interactive installation, created in collaboration with former bangaloREsident@Srishti Thomas Heidtmann, that spans a visual and acoustic connection between outer space and physical spaces that surround us. It is an orchestra of movement using elements from outer space, nature and human bodies as instrumentations. An expression of the ever-changing moment we are living in: NOW. The installation brings in sounds from all these spaces in real-time to a modular synthesizer, the heart of the installation, that Das created exclusively for the project. It is used to perform live as well as for a permanent sound installation. The synthesizer is accompanied by CubeSat-like objects that are part of Heidtmann’s "Place in Orbit" project, wearable gloves and plants with sensors. © Bidisha Das The experience is like having multiple ears aimed in different directions and in various locations at the same time. The real-time data from the spaces and the output result are unique each time it is performed: Natural sounds and sounds from the universe, all merging together – life, that is thriving everywhere and binding us together to live in the moment, NOW. NOW – A Kinetic Life was presented at the Art Laboratory Berlin from August 3 to 5, 2018 together with an Artist Talk by Das and Heidtmann.